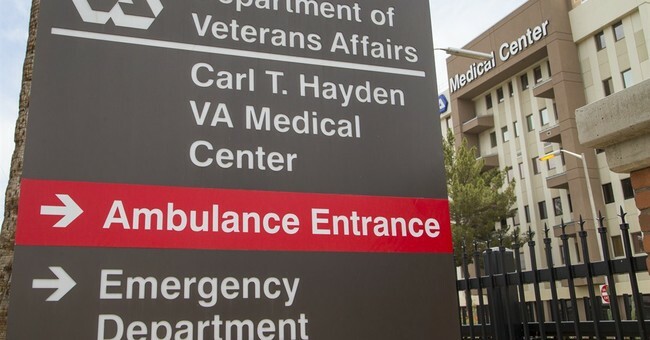 On Wednesday, we learned that the Department of Veterans Affairs has been forced to rehire the former director of the VA Medical Center in Washington, D.C. Brian Hawkins had been fired in July after the completion of an internal investigation. This fireworks-laden firing stemmed from Hawkins’ incompetence in handling the administrative duties of medical care for our veterans. Removed as director in April, an inspector general’s report later revealed that under his leadership the hospital endangered patients with its rampant organizational and managerial dysfunction. Roughly $150 million in medical supplies were not inventoried. As a result, sterile surgical items were kept in dirty areas. Nurses were forced to spontaneously rifle through hospital rooms for emergency equipment. Hawkins shared sensitive information about VA employees and administrative decisions with his wife—not a VA employee—via email. Now in a display of the bureaucratic cesspool at work, the federal Merit Systems Protection Board has ordered a stay on the VA’s firing of Hawkins, who argued he was wrongly terminated. Fortunately for our veterans, he now holds an administrative position at VA headquarters instead of one in patient care. This is exactly what is wrong with Washington, D.C. Some time ago, I wrote a column for Townhall.com about the impossibility of fixing the Veterans Administration, based on the assumption that you can’t truly fix any organization when you don’t have the authority, power or ability to cut the cancer out of the organization. In other words, if you can’t fire the bad, the good will never get better. With President Donald Trump’s support, Secretary Shulkin made efforts to prove that the administration could get better. Exhibit A was the executive order indicating that Shulkin had the authority to replace those people that were putting the healthcare of our veterans at risk. The Merit Board’s decision second-guesses the authority of the secretary and will undermine the efforts of the Trump administration to turn around Veterans Affairs and the VA medical system. Can you imagine any organization succeeding when you can no longer threaten the bad actors with replacement? Not when, in the back of their minds, they know they can file a grievance claiming they were wrongfully terminated and then have an opportunity to take a very long vacation and receive back pay, along with a job at the end of that vacation. The VA is the second largest government entity in the nation. Unlike the House of Representatives, the Senate and various other government organizations, this is now an organization with strong, steadfast leadership. It also happened to be one of the more dysfunctional organizations in the government until President Trump took office. In June, the president signed the VA Accountability Act, and I expect it will be a part of the ammunition that Secretary Shulkin will be armed with as he hopefully takes the next steps to reinstate Mr. Hawkins to the rolls of unemployment. Hawkins was fired because he simply failed to provide effective leadership at the medical center. Ineffective leadership is something the government knows a few things about. Here, we see more ineffective leadership being exercised in the reinstatement of failed management to a Veterans Administration in the process of trying to heal. It would seem the more the swamp gets drained, the more the alligators are exposed. Let’s hope this action will be merely a speed bump along the road to recovery for the VA. We must ensure that Shulkin gets the support he needs from the president and from the dysfunctional leaders on Capitol Hill. Speaking of dysfunctional leadership, let’s hope when they get voted out next November, they don’t file a complaint of being wrongfully terminated and get reinstated. They can’t do that, can they?